After the ferocious last two months, we are hoping for a calmer gentler April! We anxiously await for all that pesky snow to disappear! As always, the brew house is keeping busy brewing all of your favorite Lazy Monk biers! As the Spring season arrives, we will be saying good-bye to the Good King Wenceslas and the Smoked Bock. Look forward to the return of the Bier de Garde and a brand new bier coming soon! Interested in trying something different? Take a page from some of our regular customers and try a combo of our Cranberry Ginger Radler mixed with the Dark Plum Sour! Delicious!!! RUM Fusion is a subset of Liscio playing lighter music that one might call smooth jazz. Fun, laid back, and perfect for a relaxing Friday evening. The winter season has taken its toll on our floors! In order to get them bright and shiny once again, we will be closed these two days. The Bier Hall reopens and if the weather permits, so does our patio!! Hard to beat a delicious bier in hand while sitting on the deck watching the river flow by! PeeWee Herman, Queen Elizabeth, Taylor Swift, Humprey Bogart, Michael Bolton, Lebron James, Aristotle….who will make it on this month’s list?! Come on down and find out! Check out our Facebook event page the day of for a chance to earn Bonus Points! This will be the last trivia night until fall! Come check out our brand new brewery equipment and get a behind the scenes look at Lazy Monk! For more information, please check out our Brewery Tour Page. Our Bier Hall will be closed on Easter Sunday so that our staff may spend the day with their families. Thursday, April 25th: Kick Off to Jazz Fest! We are kicking off to Eau Claire’s Jazz Fest with a New Orleans inspired meal by Chef Michelle at Forage Kitchens and some fabulous entertainment with one of our favorite jazz bands – Liscio! A classic Pork and Andouille sausage jambalaya with choice of shrimp on top. Served with perfectly Sauteed collard greens and Cajun corn; complete your meal with Jalapeno corn bread and delicious King Cake for dessert! Dinner tickets are $16/person and can be purchased in our Bier Hall starting today! Please sign up in advance as tickets are limited! Dinner from 6-8pm; Music from 7-10pm; Bring your spouse, bring your a friend, bring yourself for a fantastic evening of fun but we will not be allowing dogs in the Bier hall during this food event! Bluestem featuring music gurus Joe Theilen and Dan Zerr. Veterans of many local bands including Eggplant Heroes, Hey Joe, Yam Cannon, and Bugbear, this duo will feature songs from many of those bands as well as other original material across many genres. Go Paint! with the Pablo Center! Food Truck Season returns with the fabulous ladies of Marigold Cafe! 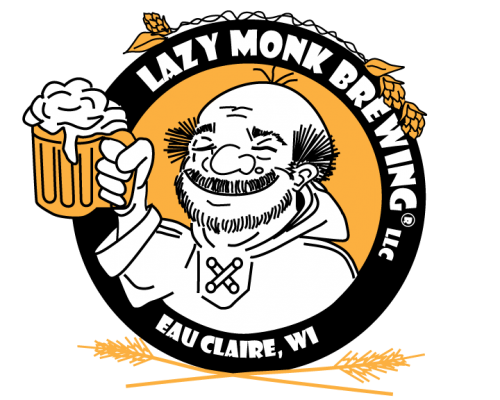 Visit 10 of our partnering Eau Claire Locations, order a Lazy Monk bier, and receive a sticker for each location. Collect all 10 stickers and enter to win a Summer Cooler filled with a case of your favorite Lazy Monk bier and gift certificates to all of the participating locations! Valid at several participating locations! Back from Seatttle, award-winning vocalist Kate Voss and freelance guitarist, Jason Goessl return to our Bier Hall! We are teaming up with Pet Food Plus and Paws Claws once again to raise money for our favorite charity and four legged friends – Bob’s House for Dogs! Participate in a 2, 3, or 4K Walk with your dog. All proceeds will go to Bob’s House for Dogs. Not up for a long walk, try the Doggy Obstacle Course! Food with Davis Dogs, Doggy Ice Cream Cones, and Live Music with AcoustiHoo! Pre-Register in the Bier Hall today! $15/family includes a Lazy Monk dog bandana (while supplies last.) Dog Walk begins at 4pm. A fabulous dinner menu with every course featuring one of our Lazy Monk Biers! Details coming soon!